Happy Friday! Today, if things go as planned(which they never do on a trip), we'll be heading to the New Jersey shore to meet up with my two BFFs. One of them has a vacation home(more like mansion) there which will have plenty of space for my little family, my friends, her family, and later my entire family who will be meeting up with us on Saturday thru Monday. I'm really looking forward to having some beachtime with the entire crew! 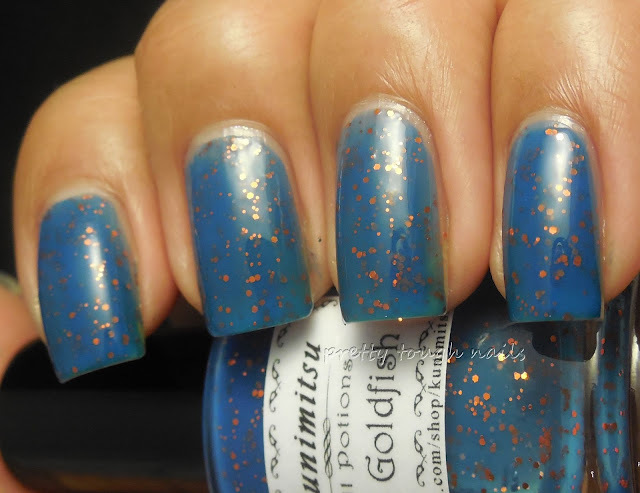 What perfect beach ready manicure to wear than Kunimitsu Nail Potions Lucky Goldfish? It's the perfect shade of blue to represent water - a deep bright blue crelly that has a smattering of copper mini glitters. It's like the copper version of speckled polish, and the colors really remind of little goldfish swimming in a pond of water. I have no problems with application and found the glitter ratio to be perfect. I used two layers and topped it with Poshe. How pretty is that polish? I love the subtle copper glitters that compliment the blue base - it doesn't overwhelm it at all and it adds a nice glint of sparkle when outdoors. This is my first time using Kunimitsu, and I'm sure it won't be my last. What's your go to polish for the beach? Ooo, bluuuuuue *drool* and with copper- it's beautimous! LOL... I know how that goes. Maybe f21 will have a free shipping day soon! It's definitely worth picking up if you like flakes. This is so pretty! I am loving the copper glitters in the blue base. It's a perfect combination. Thank you! It was kismet that you decided to swatch Barielle Falling Star after this one. It makes a great comparison! I love Kunimitsus! The formula is just awesome. You're so right! I really need to pick up some more from her!